When fastening your boots to the deck of the snowboard, you might notice that your toes hang over the edge of the bindings. A slight amount of toe overhang, usually around 2 inches, will not hinder your performance while traversing the mountain slope. However, too much overhang could send you skidding across the riding terrain. According to 360 Guide, the toes of your snowboard boots should not extend more than a few inches past the footbeds of the bindings. When performing high-speed maneuvers and hairpin turns, the sharpened edges of your board will dig into the snow. If the toes of your boots make contact with the ground, it will prevent the edges of your board from penetrating the snow. 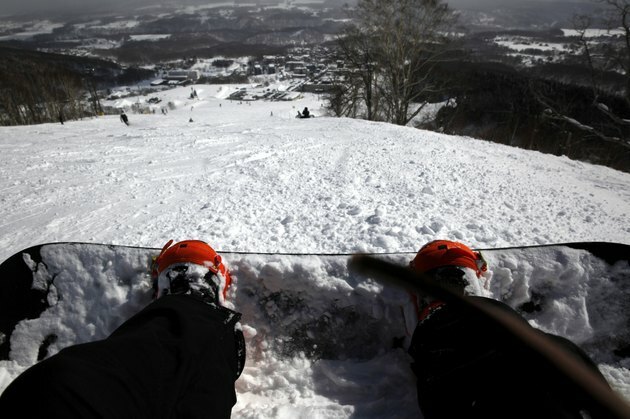 This might cause you to lose control of the snowboard, resulting in painful falls and slide outs. If your toes hang over the edge of your snowboard, you might want to think about upgrading your equipment. The footbed of the snowboard binding should roughly correspond with the dimensions of your boot. Choosing a slightly larger binding model will decrease the amount of overhang. According to the snowboard experts at REI, one solution to overhanging toes is to purchase a wider snowboard. Wide model snowboards generally are designed for riders who have a shoe size of 10.5 or more. Your boots might be positioned incorrectly within the confines of the binding straps if your toes hang over the edge of the snowboard. Loosen the toe and ankle strap of the snowboard bindings by lifting the appropriate release mechanisms. Align the tread of your boots over the binding's foam-injected footbed. Slide your foot back until the boot cuff makes contact with the binding's highback plate. Re-tighten the binding straps to determine if this repositioning technique helps to decrease the amount of overhang. Too much forward lean could cause your toes to hang over the edge of the snowboard. To change the forward lean, find the adjustment dial located on the back of the binding chassis. Rotate the dial counterclockwise to decrease the snowboard binding's forward lean. Repeat the adjustment technique until the the vertical highback plate of the binding sits roughly parallel to the heel edge of the snowboard. Place your boot into the snowboard binding to see if this corrects your overhang problem.